Jack Babcock never saw No Man’s Land, or the poppies in Flanders Field; did not fight at Vimy Ridge, or at Passchendaele; never flew a biplane in the skies over Europe; never attacked a U-boat, or a Zeppelin. In 1916, he volunteered for the Canadian army, another Ontario boy eager to leave the family farm to see the world. The late discovery of his tender age — he was just 15 1/2 — saved him from being ordered to the trenches on the Western Front in France. The disappointment he felt then was tempered over the years by the knowledge that legions of his peers had been cut down in their youth. More than 60,000 Canadians died in the Great War, a terrible toll from which emerged in this land a greater sense of nationhood. Mr. Babcock escaped the bloodletting with the signing of the Armistice halting “the war to end all wars.” Seeking opportunity, Mr. Babcock settled in the United States, where he emerged from obscurity decades later, surviving as the last known Canadian veteran of the First World War. The unrequested burden of representing all the soldiers, sailors and airmen who had served in the conflagration fell to a man whose war record, as he readily admitted, reflected little more than a youth’s eagerness for adventure. “I didn’t do any fighting,” he said. For all the killing, for all the slaughter, Mr. Babcock never fired a shot in anger. Though he had not seen action, Mr. Babcock proved to be a most worthy representative of his brave generation. He entertained visiting Canadian dignitaries, including Cabinet ministers and military officers, at his home in Spokane, Wash. The centenarian willingly accepted as his duty the responsibility to answer all reporters and military historians keen for insight on his wartime experience. He did so with good humour, even as his hearing failed in recent years, making conversation difficult. Mr. Babcock readily acknowledged the importance of youth serving their country in uniform even as he warned against the savagery of battle. He politely declined any suggestion his death be marked by a state funeral, as he felt his own contributions were not worthy of such an honour. It was said his wish was to have his ashes scattered in the mountains. A vibrant man well into his 11th decade, Mr. Babcock golfed until only recently and regularly attended church. He had brilliant blue eyes their clarity all the more striking for his shock of thick white hair. Mr. Babcock attributed his longevity and his positive outlook to his second wife, 29 years his junior, who doted on him. He was a rare man to have celebrated a 30th wedding anniversary more than once. Two years ago, he regained a Canadian citizenship lost when he became a naturalized American citizen in 1946. John Henry Foster Babcock, who was born in the final months of the reign of Queen Victoria, enlisted to serve King and Country under her grandson, George V.
His prosperous and hard-working father, James Babcock, of German ancestry, owned a sawmill and a farm, on which he also raised cattle, in Frontenac County, Ontario. He had fathered five children when his wife and sixth child both died in childbirth. After remarrying Isabelle Anne Foster, a woman of Irish stock 10 years his junior, he fathered five more children. Jack Babcock was his eighth child and third son. The family’s fortunes suffered when James Babcock was killed while falling a tree in March, 1907. Jack was age six at his father's death. The family lost the farm, though the boy remained to work as a servant for the new owners. He remembered being with an older half-brother when approached by an army lieutenant and sergeant in 1916. Despite an accurate recording of his birth date in 1900, Jack Babcock’s enlistment papers, dated Feb. 4, 1916, describe his “apparent age” as 18. The fair-haired boy stood all of 5 feet, 4 1/2 inches. He signed as Foster Babcock in a schoolboy's uncertain scrawl. He was assigned to the 146th Overseas Battalion of the Canadian Expeditionary Force. Mr. Babcock was posted to the armoury at nearby Kingston, Ont. He once recalled marching down Princess Street where he was embarrassed to have been spotted by an uncle, as his own long pants did not reach his ankles. He was then sent to the base at Val Cartier, Que., where he underwent a physical. Instead of joining the men overseas, Mr. Babcock wound up toting freight on the docks. The voyage overseas lasted nine days. Mr. Babcock remembers his troopship being escorted through U-boat waters by a light cruiser and three destroyers. Once again his official documents betrayed him, however, and the eager but underaged soldier was dispatched to a Boys’ Battalion at Bexhill-on-sea in Sussex, where non-commissioned officers prepared the youngsters for eventual service in France. The only action he would see in the war came during a donnybrook at Kinmel Park Camp in North Wales. At the time Mr. Babcock reminisced about the Armistice in 2005, he was one of only three living Canadians to have been in uniform on that day. 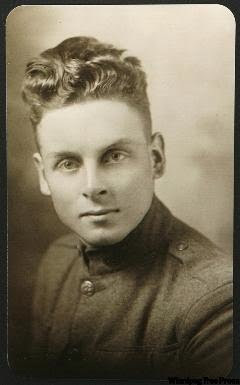 Mr. Babcock worked as a labourer in Canada before emigrating to the United States, where he joined the army in 1921. His expertise on the parade field earned him promotions and he was soon a sergeant. He left after three years in uniform. He then found jobs as an electrician, a trade he learned in the army. He later owned his own businesses in oil and natural gas, completing his working life at age 87 in the employ of his son's waterworks equipment business. Mr. Babcock, who became an American citizen, was unaware of his status as one of the last remaining Canadian veteran of the First World War. He saw great changes in his lifetime, even at the Ontario farm at which he grew up. In 1955, aerial photographs revealed the farm as the site of a meteorite impact some 450 to 650 million years ago. An Ontario government plaque today marks the Holleford Crater. Mr. Babcock’s wife, Elsie, whom he had married in 1932, died in 1976. Some months later, Mr. Babcock proposed to one of her caregivers, Dorothy (Dot) Farden, a 47-year-old nurse. Her concern was his advanced age. She did not want to attend a funeral too soon after a honeymoon. Rebuffed, her septuagenarian suitor persisted. He suggested they try dating. A second marriage proposal was accepted, though the bride insisted her groom promise to live at least another decade. They celebrated their 33rd wedding anniversary on Dec. 26. Mr. Babcock made the most of his longevity, earning a high school diploma by correspondence at age 95. He had never returned to school after enlisting. He became the last known surviving Canadian veteran following the death in May, 2007, of Percy Dwight Wilson, aged 106. Mr. Babcock’s death leaves Frank Woodruff Buckles, who turned 109 on Feb. 1, as the sole surviving American veteran of the Great War. On his birthday last July, Mr. Babcock enjoyed one of his favourite treats — long-cut french fries served with tartar sauce on the side. In recent years, he received several honours, including a minister’s commendation from the Canadian veterans affairs minister in 2008. As well, the Royal Canadian Regiment named him regimental patriarch. It was reported he marked the occasion by belting out O Canada. Jack Babcock was born on July 23, 1900, on a farm at Holleford, Ont. He died on Thursday (Feb. 18) at his home at Spokane, Wash. He was 109. He leaves his second wife Dorothy, known as Dot, whom he married on Dec. 26, 1976. He also leaves Dot's two adult sons, Eric and Marc Farden. From his first marriage, he leaves John H.F. Babcock, Jr., of Newport, Wash., and Sandra Strong, of Hamilton, Mont. He is survived by 16 grandchildren and several great-grandchildren. He was predeceased by his first wife, Elsie, who died in March, 1976, after 44 years of marriage. He was also predeceased by a grandson, Christopher Babcock, a junior high school teacher who was killed, aged 25, during a rebel attack in El Salvador in 1989.